From The Handbook of Texas Online.BLOOMING GROVE, TEXAS. 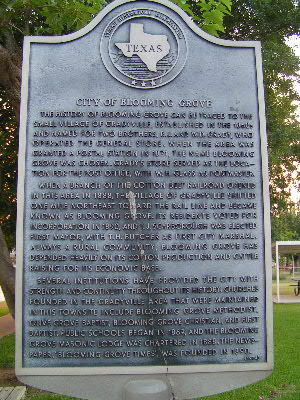 Blooming Grove, also known as Gradyville, is on State Highway 22 and Farm Road 55 ten miles west of Corsicana in northwestern Navarro County. The town originated in a store established by R. J. Grady and Sam Andrews shortly after the Civil War. When a post office was established there in 1871, citizens met at the White Church Cemetery to choose a name for the community. The town was named either for a grove of blooming trees or for the son–Blooming DaviS–of a Doctor Davis. After 1881 the community moved a mile north to be on the Cotton Belt rail line (officially known as the St. Louis Southwestern Railway) and merged with the community of White Church. The new town grew rapidly from a population of 200 in 1884 to 800 in 1890, when townspeople sought incorporation. The city limits and boundaries were officially set on March 31, 1890. The oldest church in town, the White Church, began as the Methodist Mission in 1869. In 1887 the community’s first public school was established. Central Texas College, a junior college, was opened at Blooming Grove under the auspices of the Corsicana Methodist Conference in 1902 but closed in 1912 because of mismanagement. The first newspaper, the Blooming Grove Enterprise, was published briefly in 1888. It was followed in 1890 by the Rustler, which later became the Times, which was still being published in 1990. 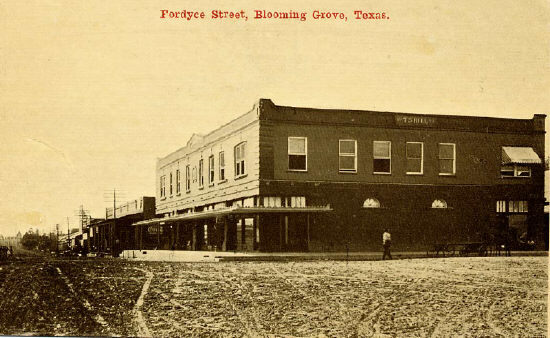 By 1900 Blooming Grove was a shipping and trade center for the surrounding area and depended mainly on agriculture for its economy. At that time the town had four gins, four churches, several grocery stores, several independent cotton buyers, two gristmills, two lumberyards, two restaurants, two hotels, and a community fair. The town declined in the mid-1930s due to falling cotton prices and the onset of the Great Depression. Railroad service to the community was discontinued in 1931. Many stores and gins closed, and banks failed. Farmers were unable to borrow money and moved away. The town’s population dropped from a high of 1,500 in 1933 to 821 in 1936. After World War II some residents left to work in nearby factories and cities. In 1990 the town had a population of 847 and eight businesses.BIBLIOGRAPHY: Annie Carpenter Love, History of Navarro County (Dallas: Southwestern, 1933). Wyvonne Putman, comp., Navarro County History (5 vols., Quanah, Texas: Nortex, 1975-84). Alva Taylor, History and Photographs of Corsicana and Navarro County (Corsicana, Texas, 1959; rev. ed., Navarro County History and Photographs, Corsicana, 1962).Carol M. RushingFrom: www.rootsweb.com. The population of Blooming Grove is approximately 847 (as of 2001). The approximate number of families is 378 (as of 2001). The amount of land area in Blooming Grove is 2.211 sq. kilometers. Blooming Grove is positioned 32.09 degrees north of the equator and 96.71 degrees west of the prime meridian.